Advantages: Bright, simple, easy to install, and they look good! Disadvantages: Haven't found a disadvantage. 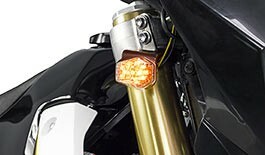 The only confusing thing I ran into was what converter to use for these 'front signal' blinkers. I have a 2006 Suzuki DRZ400s. Turns out Suzuki used the Yamaha style converter in the front of the bike. That was all I found to be confusing. BUT! I sent them an email asking what that was about, and they were quick to respond with an answer. I'm very satisfied!